Prehospital and Disaster Medicine (PDM) is a peer-reviewed health and medical journal that has been published for more than thirty years. 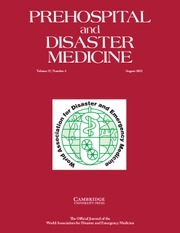 PDM is sponsored by, and the official publication of, the World Association of Disaster and Emergency Medicine (WADEM). The principal mission of the journal is the distribution of information relevant to the practice of out-of-hospital and in-hospital emergency medical care, disaster medicine, emergency public health and safety, and disaster mental health and psychosocial support. To assure highest standards in publication of scientific content, PDM supports and follows international standards for peer review of all material that may be used as an authoritative citation or reference. It is a signatory with the International Committee of Medical Journal Editors (ICJME) and the Committee on Publication Ethics (COPE).